Good analysis about what not having Ethiopian conflict means for Eritrean rule in this op-ed. Tyler Cowen was recently in Ethiopia and wrote several interesting posts and columns. Busara in Nairobi is hiring for a number of positions. Evidence Action is hiring a Deworm the World Director. Richard Thaler writes about the evolution of behavioral economics in AER. (Gated, but you can watch him explain it in his Nobel lecture version and slides). h/t Imran Rasul. Elizabeth Warren has been arguing with economists over her previous academic research on the number of medical bankruptcies in the U.S. – hint: methodology for counting matters a lot to the final number you come up with. The DRC count of Ebola infections is at 60, and the WHO has been preparing the neighboring countries for it, including with vaccinations. 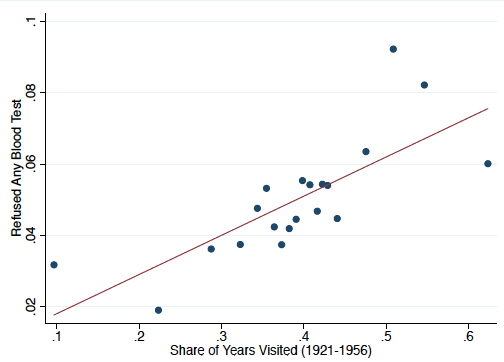 The graph above comes from an interesting paper that Sara Lowes and Eduardo Montero describe in VoxDev, looking at how forced vaccination campaigns by the French military in colonial Central Africa against sleeping sickness in the 1920s through 1950s still have effects today. The vaccinations were often at gunpoint and had serious side effects. The result may have been lasting mistrust of the medical establishment – in the areas where the campaigns occurred, people today were less likely recently to accept a free blood test for anemia or HIV, or vaccinations. It recalls Alsan & Wanamaker ‘s finding that in the U.S. after the revelation of the Tuskegee Syphilis experiments in 1972, African-American men (in particular the ones closer to Macon County, Alabama, where the experiments happened) became less likely to visit doctors. They estimate this caused an up to 1.4 year drop in life expectancy for older African-American men years later. I was able to get latest news and a glimpse of everything that has been happening all across the globe. https://bestvacuum.reviews/leaf-vacuum/ is another source of collective and latest information.